Originally published by Unistoten camp. Images by Micheal Toledano. The creation of the Gidumt’en Checkpoint was announced in the Wet’suwet’en feast hall, with the support of all chiefs present. Under ‘Anuc niwh’it’en (Wet’suwet’en law) all five clans of the Wet’suwet’en have unanimously opposed all pipeline proposals. Article 10 of the UN Declaration on the Rights of Indigenous Peoples clearly states “Indigenous peoples shall not be forcibly removed from their land or territories.” Any removal of Wet’suwet’en peoples by the RCMP, or any other authoritarian forces, has directly violated UNDRIP and the Trudeau government’s promise to implement UNDRIP. 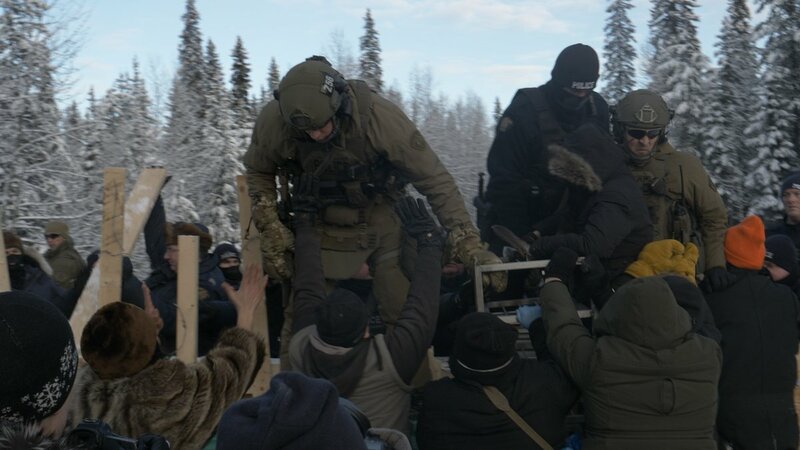 The RCMP have now installed a roadblock on the Wedzin Kwa (Morice River) Road, through Gidumt’en territory and the only access road to Unist’ot’en Camp, effectively cutting off communications, media, and supplies to those living there, including clients of the Healing Center. At the time of this publication, the Unist’ot’en Camp is on high alert for a similar violent invasion of their checkpoint. The world is watching.